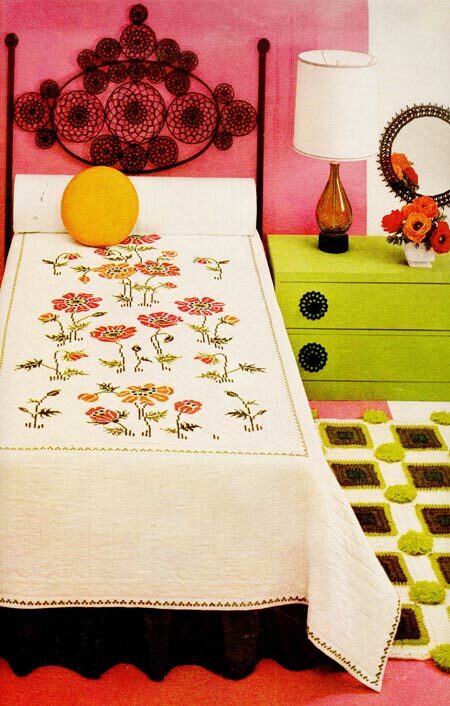 It's a 1970 bedroom complete with poppy needlepoint bedspread, quilted bolster and crocheted rug. The headboard, drawer pulls and mirror are made of embroidery hoops and crochet. Even the lamp is handmade, created of an old glass bottle and new wiring. Not so shabby - and chic! Source: McCall's Needlework & Crafts, Spring-Summer 1970.